How can you make a meaningful impact to help the environment, today? Using less energy via energy efficiency technology is a simple way to help. It’s no secret that our planet is warming up and according to the World Meteorological Organisation (WMO), 2015 was the hottest year on record, with intense heat waves, exceptional rainfall and devastating drought. The trend has continued into 2016, with February, March and April all breaking records with global temperatures well above the long-term average. Given the magnitude of the situation, it’s easy to feel powerless to make a meaningful impact, but every little bit helps. Even small changes to your daily routine and making smarter, greener choices for your energy supply help. Investing in energy efficiency technology that meets your family’s specific needs, can also help protect the environment. Reducing your ecological footprint could also end up saving you a lot of money on energy bills, so here are 23 effective energy efficiency gadgets you can use at home or on the go. Scroll down to check out the gadgets and see how they can improve on your energy efficiency. We know not all of these clever gadgets are available in Australia yet, but we think it’s good to know what’s out there, to inspire you to help improve the energy efficiency in your home. 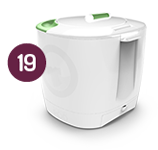 Regular electric water kettles can eat up a lot of electricity, especially if you tend to fill them up when making just one or two cups of tea. The SunRocket Solar Kettle provides a more energy-efficient way to heat water and can be especially useful when hiking or camping. For outdoor adventurers, keeping food fresh for days at a time can be a bit of a challenge, as portable fridges usually require electricity to run and aren’t the most energy-efficient. So the Giant Power Solar Fridge Kit from Aussie Batteries & Solar is an ideal solution whether you need to carry along food supplies or keep your catch of the day cool. It’s designed with the great outdoors in mind and has stainless steel casing, heavy duty handles, rust and hail proof solar panels as well as an insulated cover bag. Today’s smartphones are notorious for their short battery life, so if you’re frequently on the go and need to stay connected, the unPlug Solar Backpack by Lumos could be a good investment. Like any regular backpack, it houses your laptop and anything else you need to carry with you, but what makes it special is its solar fabric. It converts sunlight into electricity and stores it in the backpack’s built-in battery, allowing you to charge your smartphone and other smaller gadgets no matter where you are. The Solio Battery Pack and Charger is another useful gadget for charging your smartphone, e-reader, iPad, Kindle or tablet on the go. It’s compact and portable, and can charge multiple devices at a time and at the same rate as a regular wall charger. Just one day in the sun is enough to fully charge the Solio’s battery, and its innovative design allows you to make the most of the sun available by tracking it as a sundial would. Diesel or petrol generators tend to be quite noisy and are generally expensive to run, which makes them a poor choice for camping or other outdoor activities. The Goal Zero Solar Generator, however, can be connected to a compatible solar panel and charged by the sun. Aside from being more energy-efficient than regular generators, it’s also satisfyingly silent and can be used to power your phone, camera, laptop, lights and other gadgets. Taking your music with you while camping, picnicking or enjoying the beach is easy with the portable Soulra Solar-Powered Sound System from Eton. It can be used for up to eight hours before it needs charging, but what makes it really useful is its 72 square inch enhanced monocrystal solar panel, which allows it to fully recharge after just five hours in direct sunlight. If you’re still using regular fixtures and bulbs, switching to LED lighting could greatly reduce your monthly energy bills. Aside from increasing your energy-efficiency and containing none of the toxic chemicals that most other light bulbs do, LED bulbs have a much longer lifespan and can be used for up to 100,000 hours before they need to be replaced. LED lights can also be dimmed, which gives you more control over the lighting in each room of the house. 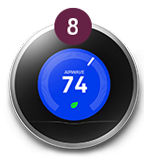 The Nest Learning Thermostat makes controlling the temperature in your home a lot simpler by adapting and programming itself to the seasons as well as your lifestyle. After a week of learning your routine, it’ll know to turn the temperature up or down before you get up for breakfast and adjust it again to save energy when you head out for the day. You can even adjust the temperature from your phone when you’re away and keep track of how much energy you’ve used each day. So you’ve heard about smartphones and smartwatches, but what about smart windows? RavenWindow has developed smart window technology that can keep your home as energy efficient as possible all year round. “A thermochromic filter incorporated into the window is activated when the exterior glass temperature reaches the transition point.Transition occurs in minutes to a tinted state, blocking solar heat, minimizing glare and reducing the load on mechanical systems,” says Del Bankston, Executive Vice President of Sales and Marketing at Raven Window. If you often find yourself worrying about whether you left the lights or TV on, the WeMo Insight Switch by Belkin can help by providing you with wireless control of the electronics in your home and can even let you know how much energy each device is using. Knowing how much energy you’re using as well as how it’s being used is the best way to come up with a workable plan for reducing your household’s energy consumption, and this is where remote energy monitoring technology comes in. Cloud-based software and mobile apps help you take control of your energy usage by allowing you to remotely track how much energy you’re using each month and how much it will cost you, so if you see that certain activities or appliances are using more energy than anticipated, you can make adjustments to ensure you don’t go over your monthly budget. If you’re often in and out of the office and need a reliable way to keep your smartphone charged throughout the day, the Window Solar Charger might be a good solution. The device can be stuck to a window where it can collect plenty of sunlight while you’re in the office, and when it’s time to head out, you can carry it along and charge your phone on the go. If you want to keep your desk free of clutter and wires but would rather not deal with the hassle of batteries, the Logitech Solar Powered Keyboard is ideal. Its sleek design and comfortable typing makes it easy to use, but most importantly, it’s powered entirely by light even when you’re indoors, and can be used for up to three months in total darkness. Imagine being able to charge your phone with the energy produced by a cup of hot coffee or ice cold drink. Epiphany Labs is launching this very technology with the onE Puck which will enable you to charge your phone on the spot, whether you’re in the office or out on the town. The device is small, lightweight, and has two sides; a red one for heat and a blue one for cold. All you have to do is plug your phone into the USB slot, place your hot or cold drink on the onE Puck and watch your phone recharge. Another handy solution for charging your iPad or phone without electricity is the KudoSol solar powered generator. The solar panel and charger are built into the iPad case, so you can charge your iPad while using or storing it, as long as it’s near a window or other source of sunlight. The energy generated by just one hour of sunlight is enough for about 30 minutes of iPad use or two hours of talk time on your phone. Whether you like catching up on your reading long after everyone else has gone to bed or enjoy sitting outside on cool evenings, the SunnyTech Solar-powered Reading Lamp is a good way to save on energy. Aside from being entirely solar-powered, its brightness can be adjusted and it’s foldable and portable so it can easily be moved from room to room. It also includes a USB slot and can be used as a power bank to charge your mobile phone if necessary. Appliances can account for as much as 30% of your home energy use, so it’s important to purchase appliances that are energy efficient. In Australia, new appliances are fitted with Energy Rating Labels that show you how energy efficient each one is, but you can also look for the blue ENERGY STAR® mark on electronics such as computers, televisions and DVD players. Buying appliances that meet your specific needs can also help. For instance, since larger refrigerators eat up more electricity, you might want to consider purchasing a smaller one if you live in a one or two-person household. Since hot water is often heated using electricity, investing in a showerhead that conserves water can help reduce both your energy and water bill. The Evolve Shower Head increases water pressure while also reducing the amount of water you use, and it even lets you know when your shower is ready for you by lowering the flow to a trickle once the water has reached the correct temperature. This helps to conserve hot water until you’re ready to get in. Regular washing machines can use 50 cents or more per load, so if you’re looking to reduce your energy consumption, The Laundry Pod could be worth considering. "We developed The Laundry POD to provide a convenient laundry option to the consumer in an eco-friendly manner", says Storebound CEO, Evan Dash. "It uses zero electricity and only a fraction of the water of conventional washers. It’s compact & portable so it’s great for apartments, dorms, camping, boating, travel sports and anywhere clothes need a little cleaning." If you’re looking to transition to sustainable energy, the PowerWall Tesla Home Battery is a good place to start. It’s an automated battery that stores up the energy generated by solar panels during the day and then powers your home at night. This allows your home to produce the same amount of energy as it consumes. You can help protect the environment and also save yourself a lot of work by investing in a Husqvarna Robotic Lawn Mower. The robotic lawn mower is low on energy consumption and since it’s powered by electricity, not petrol, it does not produce any harmful emissions. It can mow your lawn without supervision thanks to its built-in safety measures and ability to manoeuvre rough terrain and slopes. And, when it’s running low on power, it’ll automatically head back to the charging station. The Mpowered Luci Solar Light is the perfect way to keep your garage or other outdoor spaces well-lit without using electricity. It’s a simple but bright solar powered light that’s waterproof and can be fully charged by the sun in seven hours. It lasts for 12 hours on its brightest setting and its collapsible design makes it easy to store when not in use or even take along on camping trips. Transportation is one of the largest sources of air pollution, so if you’re looking to minimise your ecological footprint, your personal vehicle is a good place to start. The ELF Solo by Organic Transit is like a bicycle and car rolled into one. "The ELF proves travel doesn’t have to burn oil and put out carbon. It runs on what we have in abundance–calories and sunshine," says Maureen Costello, the General Manager at Organic Transit. "Like any other bike, the ELF needs only the strength in your legs to make it go, but it also has an electric motor to give you a boost of power whenever you need it. You can maximize your calorie burn by just using the pedals or stay cool and comfortable by letting the motor do all the work. Meanwhile the solar panel charges the battery as you ride and when you leave it parked in the sun." If you’d like to take control of your energy usage today, Powershop can help. Signing up takes just five minutes. Find out more about how to make the switch now.